Become an Undercover Judge at The National Maritime Museum in Falmouth! 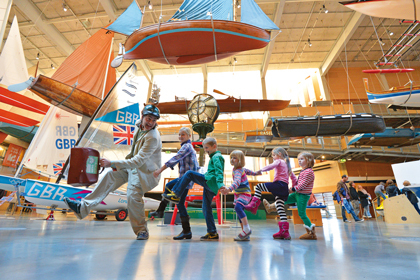 The National Maritime Museum Falmouth has been shortlisted for the Telegraph Family Friendly Museum Award – by far the biggest museum award in Britain and the only one judged by families. The winner is picked by undercover family judges visiting the museum anonymously and reporting back on what they find. Kids In Museums are now recruiting families who would like to be judges. All a family needs to do is email award@kidsinmuseums.org.uk and they will be supported through the judging process. It’s free and fun, and gives another reason to spend time at a fabulous local museum! You are, of course, welcome to visit more than one venue too if it coincides with family holidays etc. We will pay reasonable travel costs for any judging families as well as covering your entry fees, if applicable. A few days after your visit, a volunteer would contact you to discuss how things went. It’s great The National Maritime Museum has got this far – and hopefully will get further! The winner – picked by the undercover judges – is announced on 13th September. Make sure you get in touch with them! More information can be found here.